fish. This contagious parasitic infestation commonly affects both marine and freshwater fish. The scariest part about the Ich protozoan is it may be present in the water without you even knowing it. This disease often only preys on fish that are stressed due to poor water quality or other factors. Symptoms: Symptoms include white spots on the body that look like sugar has been sprinkled on the fish. Your fish may also be darting and rubbing his body against tank decor. It is not unusual for the spots to be the only symptom of this disease. Cause: Stress and poor water quality .Ich is most common in water under 78˚F [25.5˚C]. Note: The Ich parasite is only visible for 4 out of the 7 day life cycle but it is important to dose for the full recommended number of days. How Can I Tell if My Betta Fish has Ich? A fish that has the Ich parasites on him will look as though he has been sprinkled with little granules of sugar or salt. A mild case may only turn up two or three small white dots but a severe case could leave your entire fish dotted with white parasites. A fish with Ich may become twitchy and try to rub its body up along the tank décor or gravel. In severe cases the fish may become lethargic or loose it’s appetite. It’s not uncommon, however for the fish to act pretty normal despite the parasites being present. Ich is quite easy to treat but left too long can be fatal. It’s very important to understand the life cycle of the Ich parasite in order to treat it properly. The protozoan has a three-part life cycle of which it is only vulnerable to treatment for approximately two days out of its life. Because some fish are more sensitive to medications then others I am going to go through the proper treatment for a Betta. 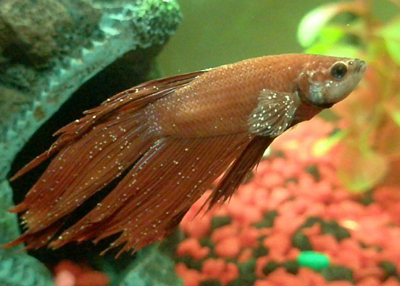 Some fish are more delicate (like scaleless fish) and may need a modified form of treatment. The Trophont is the adult protozoan that is feeding on your fish. This is what you are looking at when you see the “granules” attached to your fish. The parasites are not susceptible to treatment during this phase. The Tomont occurs when the Trophont [above] releases from your fish and falls away. It then begins to divide hundreds of times in your tank but is too small to be seen by the naked eye. To the inexperienced aquarist it may appear that your fish is healed but the protozoan is still not susceptible to treatment during this phase. It is just reproducing and will attack your fish more severely if not handled in the next phase. This is the phase where the microscopic parasites are free swimming around your tank and are most vulnerable to treatment. While they are looking for a host it is important to be medicating your tank. With proper treatment the parasites will die off during this stage before feeding on your fish and starting the cycle again. 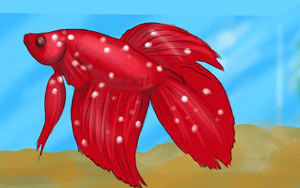 To treat your betta it’s important to know that the Ich parasites are contagious and the medication is fairly strong. It’s best to move your fish to a hospital tank if he has tank mates so they are not exposed to more parasites or unnecessary medication. The medicine used may kill helpful bacteria so activated carbon filters should be removed during the treatment process. The Ich parasites thrive in cooler water below a temperature of 78˚F [25.5˚C] so slowly raise the temperature in the tank to around 80˚F – 82˚F [26.6˚C – 27.7˚C] over the next 24 to 48 hours. Carefully follow the directions on the medicine bottle remembering to perform 25% water changes before each dose and to continue dosing for several days past the visible signs of the disease. Since fish generally become infected due to stressors it’s imperative that you determine what may have caused the fish to get sick to begin with. Check your water parameters and make any corrections as needed. If your Betta fish has tank mates, move him/her to a hospital tank. Increase the water temperature up to 86 degrees Fahrenheit. The Ich parasite prefer cooler water. Administer medicine (Rid Ich Plus) to the aquarium. Cycle the water for a number of days. Remove the previous water and replace it with fresh, clean water.